﻿ Fells and Friends horse trekking weekend with Mid Wales Bunkhouse, Tipi and Camping. Fell Ponies and friends riding weekend at Mid Wales Bunkhouse, Tipi and Camping from Friday 23rd June to Sunday 25th June 2017. We will be leading two rides based at the Mid Wales Bunkhouse, Tipi and Camping on the 24th and 25th June, a full day picnic ride with the option of a shorter alternative on the Saturday and a morning ride of about 2 hours on the Sunday. 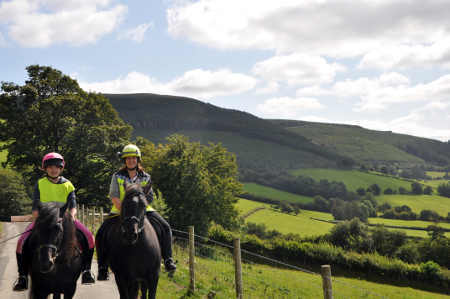 Non riding partners and friends are welcome to join us, either to walk, or just to socialise and enjoy the Mid Wales Countryside. Accommodation will be available in the bunkhouse, where you can enjoy a unique, convivial atmosphere and probably make new friends, or you can bring a tent or caravan. Otherwise, for a really authentic western theme the tipi will also be available. Inclusive prices will be as below. Anyone wishing to ride for just one day is welcome to join us on the morning, although we do need to know that you're coming beforehand and picnic lunch can be provided on request at a cost of £5.00 per person. There is no charge for the ride. Full board which is a bed in the bunkhouse, evening meal Friday and Saturday, breakfast and packed lunch Saturday and Sunday, and grazing for ponies £75. Camping prices. £5 per person per night and £5 per pony per night. Meals available on request but please pre book! Evening meal is £12, packed lunch £5, breakfast £5. The tipi is also available by arrangement. Bring your own tipples and tales for the campfire. Just a slight warning though, if the weather is wet we may have trouble with soft ground and lorries. We have limited hard standing areas, otherwise there is space for a few lorries parking on the council lane adjacent. There is no contractual obligation with the rides, for which there is no charge. All riders and guests participate as a group of friends, at their own risk and no liability can be accepted for any accident, injury or loss, however caused. 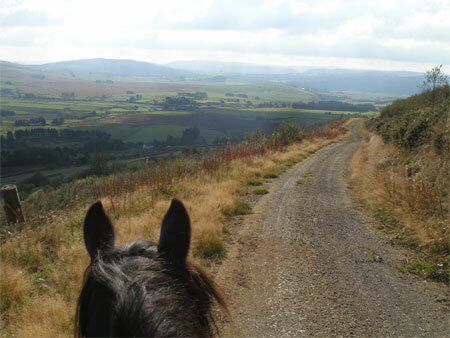 The management of Woodhouse Farm Ltd are available solely to propose a suitable route, which riders are free to follow or not at their own discretion. However we would expect riders to take the usual sensible precautions when riding on the road and across country. For the enjoyment of the group riders and horses need to be reasonably fit and able to maintain an acceptable pace. All participants should be suitably equipped with hard hats and appropriate warm and waterproof clothing. High visibility clothing is also preferable. Food and water should also be carried. Failure to comply with these conditions can affect the safety and enjoyment of the whole group and each individual should give consideration to this fact before joining the ride. Saturday ride approximately 4 1/2 hours in the saddle, with a shorter alternative, the length which can be decided according to the wishes of the riders. Picnic lunch. Sunday morning ride approximately 2 hours with light refreshments on return to the bunkhouse. In the event of inclement weather or other reason beyond our control we reserve the right to alter the routes at short notice.